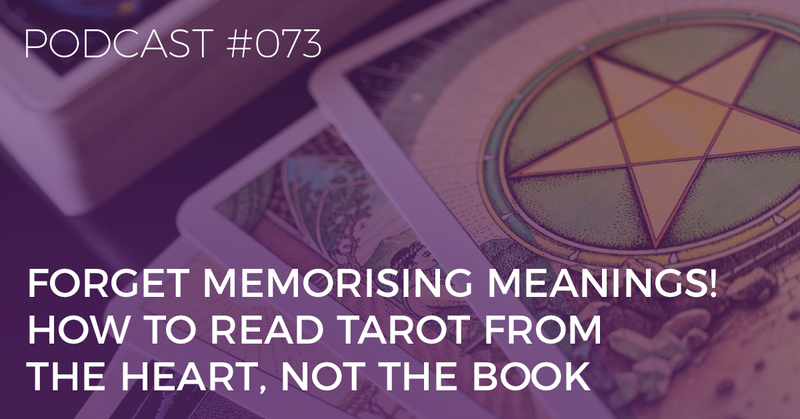 Welcome back to part two of my podcast episode series on Birth Cards and Tarot Constellations! We started the journey in Part 1 – or Episode 86. If you haven’t listened yet, catch up via biddytarot.com/86. I showed you how to calculate your cards & what the first 6 combinations mean for you. And in this episode, I’ll go thru the remaining 7 and show you how to integrate the Birth Cards into every-day life. 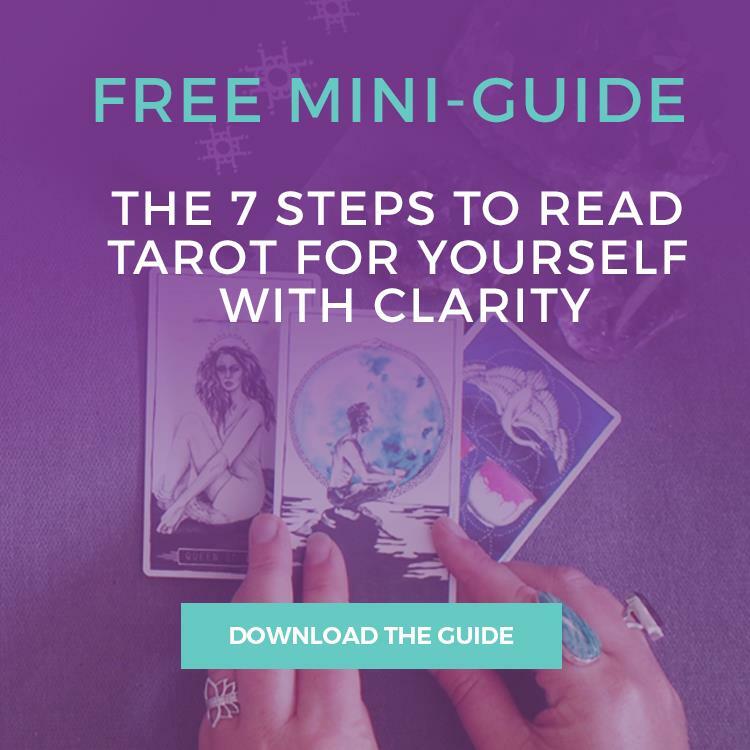 You can also download your free guide to the Tarot Birth Cards, including a description of each combination and what it means for you. This is such a powerful, yet simple, resource to help you discover your life purpose using just your birth date and the Tarot cards. 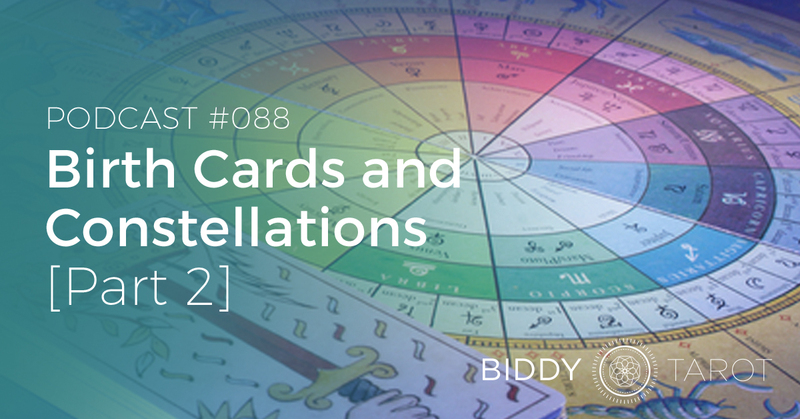 You’re listening to the Biddy Tarot Podcast, and this is Episode 88: Tarot Birth Cards and Constellations (Part 2). Hello, and welcome back to the Biddy Tarot Podcast. Have you ever wondered about your purpose this lifetime and why you’re really here? Well, for many of us, our whole lives are spent trying to work this out, and day by day, we get closer and closer, as we connect deeply with our inner wisdom and find our way forward on this spiritual journey. So, in this two-part series, I want to help you on your journey by sharing with you a powerful yet simple resource to help you discover your life purpose, using just your birth date and the Tarot cards. Now, we started this journey back in Part 1, Episode 86, and if you haven’t listened to that episode yet, you can catch up via BiddyTarot.com/86. In that episode, I showed you how to calculate your birth cards and also what the first 6 of 13 combinations mean for you. In this episode, I’ll be going through the remaining 7 combinations of birth cards. Plus, I’m also going to show you how to integrate the birth cards into your everyday life. Now, I have created a very special free mini guide for you for the Tarot birth cards. Inside of that, you’re going to find how to calculate your cards and what each of the combinations mean for you. 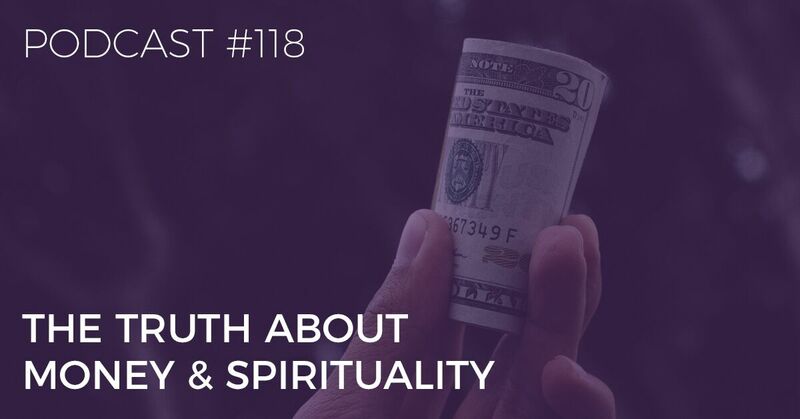 Make sure you check it out—it’s over at BiddyTarot.com/86, and you’ll also find it on this episode as well at BiddyTarot.com/88, which is where you can get the show notes, the transcript for this episode and lots more. Lots more? I don’t know—my pretty face? Now I’m being silly. OK, beautiful. So, let’s continue our journey through the Tarot birth cards. We got up to the Devil and the Lovers, which was card 15 and 6. Now we’re moving into the Tower (card 16) and the Chariot (card 7). This, again, is a very interesting combination. It’s so enriching when we start to put cards together in the Tarot because we start to see either commonalities, things that look very much the same, or we see a dichotomy or two energies that are playing out. Do they support each other, or do they negate each other in some way? Now, when I’m having a look right now at the Tower and the Chariot, it’s very interesting because the Tower, to me, shows this complete lack of control. The lightning bolt has hit the building. There are flames everywhere. People are leaping out. It’s as if they thought, “I had built this big tower. It’s ginormous! It’s on the highest point possible. Nothing should ever make me feel unsafe in here. Nothing will ever burn this thing down.” But here we go—all of a sudden, BANG! And everything has started to change. And yet, the energy in the Chariot is so very different. He is sat firmly in his chariot. It surrounds him. He’s wearing armour. He has the black and the white sphinx, and it’s as if he is in full control of his environment, and he enjoys that control and protection. It allows him to move forward Again, contrast that back to the Tower, where it’s just mayhem, and it feels like everything is spiralling out of control. Even when you thought you had everything built up around you, it turns out that things can change in an instant. With this card combination, you are a mover and shaker. You’re here on this earth to challenge the status quo, to shake things up and to tear down the barriers and the obstacles that get in our ways. Certainly, I see that with the Chariot that he has this need to drive things forward, to move forward. And, in fact, imagine if he had the Tower in front of him. Do you think he would go around it? Maybe. Or maybe he would just go right through it if that’s what he needed to do. The will and determination of the Chariot and then the disruptive force of the Tower shows that you are willing to just move forward on anything. Once you’ve set your mind to it, you’re going to make it happen. I think that’s incredibly powerful (I keep saying that word, but it is!). You’re known for speaking your mind and being incredibly determined and forthright, and nothing is going to stop you on your path. You have no fear, and you continually rise to the challenge even when many others would quit. You’re a game changer and a force to be reckoned with. Amazing, right? Let’s move on now to the Star card (card 17) and the Strength card (card 8). Interestingly, looking at the imagery here, we have two women. In fact, they’re facing the same way, and it’s almost as if they’re in a similar pose, but the setting is quite different. There’s this gentleness with the feminine energy, and yet, with the Strength card, we have the ferocious, and this fair maiden is using her gentle persuasion skills almost to exert control over the lion without having to use force. It’s a really good card! With the Star card, it’s about that transformation piece—refreshing, rejuvenating, re-energising, particularly as she kneels here in her full nakedness at the lake. She’s using the water to ground her into that pool of water, and above her are those stars just giving her even more powerful energy. With this card combination, you’re here to shine your bright light in this world and create a sense of hope, faith and strength not just for yourself but for others as well. You’re travelling on your soul’s journey, but you’re also inspiring others to find their path. With this Tarot birth card pair, you’re a healer and a source of light for many people. Your personality is optimistic and hopeful, and you have complete trust in the universe, knowing that you’re being guided along your path. You come from a place of deep inner strength that is fortified by the strength of your belief and your faith. Let’s move on now to the Moon (card 18) and the Hermit (card 9). Now, both of these cards have a very dark background. In some ways, I see this as connecting on a soul level, a subconscious level and even into more of the shadow aspects of oneself. You have this guiding light. In the Hermit, you have the light of the lantern, and in the Moon, obviously, you have the light of the moon. While it will not illuminate everything, it illuminates at least what you need to see for now. It’s very interesting. This illumination is what allows you to see what you need to see that maybe others cannot see because you’re here in the darkness, but you are seeing what you need to see. With this card combination, you have a naturally talent and ability to see through things. Your focus is not on what’s directly in front of you but what’s also going on behind the scenes. You’re interested in subconscious mind, the intuition, and all that’s hidden and unseen. You have a deep desire to uncover your spiritual path, and you do so through meditation, spiritual journeying, visualisation and so on. Now, particularly with the Hermit, you might be a recluse and prefer to withdraw from the world around you so that you can then focus your attention on your spiritual path and your inner knowledge. You stand in the shadows so that you can observe from afar, taking in all that is unseen. Hmm, one of those deep, dark energies. Positive, but deep and dark and murky—in a good way. The next combination is one of the unique ones which has three cards in it. It starts with the Sun (card 19), plus the Wheel of Fortune (card 10), and the Magician (card 1). With this combination, again, even just looking at the imagery here, it’s much brighter, and there is so much more energy in it than perhaps what we see with the Moon and the Hermit, which are quite darker cards. With this three-card combination, you’re an eternal optimist and a master of manifestation. You see the good in all things, and you find positivity and fun in all aspects of your life. You have a talent for turning your situation around so that it truly works for you no matter what the universe is throwing your way, and that’s certainly the influence of the Wheel of Fortune. Moderated with that is that positive energy of the Sun and the manifesting energy of the Magician. You might be guided towards things like the Law of Attraction and the art of manifestation. You’re particularly successful in creating your desired future. Maybe you’ve met those people (I certainly have) who seem to be able to manifest things out of thin air, and I love it. They set their mind to something, they know it’s going to work for them, they call in their guides, they ask for what they want, and then they receive—incredibly powerful. All right, my friends, we have three more to go. This is Judgment (card 20) and the High Priestess (card 2). Now, this is a really interesting combination, and it’s quite ethereal in some ways. With this combination, you may feel at times as if you are not of this world. You lie somewhere between the spirit world and the earthly world, floating between that veil of consciousness throughout your lifetime. You may feel called to the spirit world, communicating with those who have passed, or being guided by your spirit guides. This is certainly a very intuitive kind of combination, so if you have Judgment and the High Priestess as your birth cards, then you can certainly expect there to be a high level of intuitive connection and spirituality. Now we have the World (card 21) and the Empress (card 3). In fact, this is my personal combination. With this card combination, you have to gift to share, and you allow this gift to really come forth, and you really birth it into this world. Think about the Empress. She’s very much about birthing and creating and allowing new things to emerge. Also, with the World, I have heard a very interesting way of looking at the World. We’ve got the naked woman coming, and she’s in the wreath. Now, one way of looking at that, given that the World is the end of the cycle (and then it moves into the Fool, where’s there’s this new beginning again), then we can actually see that wreath as if it were a birth canal, and this woman is being birthed from one end of the completion cycle and into a very new cycle. Partnered up with the Empress, we definitely get that feeling of birth and creation and new things emerging. Now, by birthing your ideas and the beauty into this world, you’re helping many, many people around the world who are going to benefit from your gifts. You’re here to help others create and achieve amazing things in their lives. Again, remember with the World, we have that concept of wholeness, of full integration, and your gift is to be able to birth things in a way that allows for fullness, wholeness and integration for others. Your personality can be very holistic, abundant, creative and expressive. You’re in your element when you are creating. I can certainly resonate with that, that’s for sure! I love it when I’m in that creation phase, and I’m birthing something into the world. I get a bit cranky when I’m just doing the regular, routine kind of work. Maybe you can relate, too. So, our final combination has the Fool. As I explained in Episode 86, we can sometimes call the Fool the 22nd card. Officially, it is card 0, but as Ruth Ann and Wald Amberstone from the Tarot School suggest, in the birth cards, call it card 22, and it then will partner up with the Emperor as well. We’ve got the Fool (card 22) and the Emperor (card 4). With this combination, you’ve got a joyous spirit and a great sense of humour, and you can see the folly in life. You’re a born leader, though you don’t yourself too seriously. You’re here to teach others how they can be in this lifetime by being a role model to those people. You can combine logic with intuition to have inspired actions that create successful results. Now, in some ways, we’ve again got this duality of energy with the Emperor, who is very stern, structured and does things by the rules, and on the flip side, you’ve got the Fool who is on the edge of the cliff, just doing what he wants without planning things. They’re completely different! With this combination, you have this opportunity to create this balance between structure and intuition or freedom and flexibility. With a keen intuition, you have the patience, determination and discipline to make things happen. Your success will also benefit others, which is very important to you. Certainly, with that Emperor energy, you want to be the king, but you also want to be able to do that with that fluidity of the Fool. Or maybe you’re feeling like “Well, I get some of it, but I don’t get all of it.” Here’s what we need to do next. Take out your birth cards and lay them out in front of you. Really dive deep into “What do these cards mean for me?” How do you see them playing out for you in your life? What do they mean for you? And so on. There are a couple of ways you can start to integrate your birth cards into your daily life. You could have a visual reminder. You could print out the images of your cards and put them up where you spend a lot of your time. Frame them. Just have them as that visual cue that these cards represent a part of yourself in this lifetime. Use your birth cards as a significator in your readings. You can use your birth cards as a significator in your readings, especially for those readings that might be around life purpose, soul purpose and those big life questions because your birth cards might play a role as that significator. Reflect on how the lessons of these cards have played out in your life so far or at present. This is a way to really personalise your birth cards. For example, the Empress, because that’s one of my birth cards, I might think about “When have I felt like I’ve been in full creation?” and I’m even think more of that mother archetype, and I might relate it to when I gave birth to both of my daughters and how I stepped into that mother role and what my experience of that was. Or with the World, how do I create wholeness and integration for myself? At what point in my life have I felt wholeness and integration? What role has creativity played with helping me feel wholeness and integration? You can start to pose these kinds of questions for yourself and really draw out your personal lessons for these cards. Finally, you can ask yourself what current lessons you are learning from your Tarot birth cards. How are these cards going to help you with what you’re dealing with right now? If you were to reconnect with your birth cards, do you get some additional insight into how to create better relationships for yourself or a more fulfilling career or clarity around what your life path is? Use these different techniques to connect with your birth cards and make them real for you. I know what happens! We go, “Oh, those are my birth cards—isn’t that amazing?” and then we put it away, and we never come back to it again. But there is so much powerful information in these cards that if you can find ways to integrate it even more on a more regular basis, then you get more and more value from the birth cards. All right, my friends, I think my work here is done. I hope that you’ve enjoyed this two-part podcast series on the Tarot birth cards and constellations. Now, just remember, you can catch up on that previous episode at BiddyTarot.com/86, and you can download the free mini-guide for the Tarot birth cards either at BiddyTarot.com/86 or BiddyTarot.com/88. Either way, you’ll grab that mini guide, and it’ll be fabulous, and it’s all there for you—super, super easy! I hope you’ve enjoyed this. Look, I’ll mention it again—if you have loved this series, and you love the Biddy Tarot Podcast, make sure that you leave a review on iTunes. 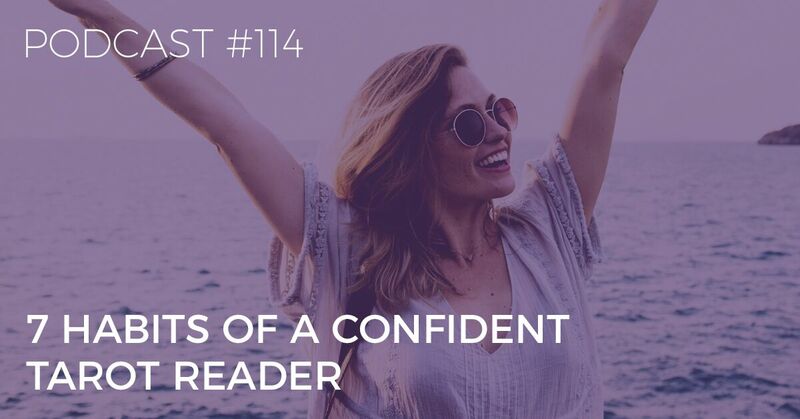 It means so much to us as validation or a little bit of a reward for everything that we put into the podcast, and it also helps Tarot get in front of more and more people. So, the more reviews that we have, the more that the Biddy Tarot Podcast gets up on the charts, and I really get a kick out of seeing Tarot popping up in all sorts of places! That’s how we get Tarot into the mainstream, isn’t it? So, leave a review on iTunes, and if you haven’t done so already, make sure you also subscribe, so you can get the podcast downloaded to your iPhone automatically, and it’s all there, ready for you to listen to each and every week. Have a wonderful, wonderful week, and I look forward to chatting with you next time. In fact… Oh my goodness! Yes! In our next episode, I am talking with Noa Knafo, and he has created the Visionary cards. They are amazing! The energy that comes off them is so strong. So, I’m having a chat with Noa to find out a little bit more about her inspirations for her cards and how she uses them in her spiritual practice as well, so make sure you listen out for that one. Have a great week, and bye for now!